Part five of a five-part series I’m doing this week, featuring shots that I took while being on the stage with bands. Nirvana was in town finishing up the mix on Nevermind and prepping for the Smells Like Teen Spirit video. Since they were in L.A., they decided to play a gig at The Roxy. Knowing that Nirvana was buzzing big time, and that The Roxy has no barricades, I decided it was a good idea for me to get there early. It was key to get there in time to grab a good spot right up against the stage, where I could shoot without obstructions. After soundcheck, I ran into Kurt and Krist as they stepped out of the club to get some air. It was great to see them again, it had been awhile. They introduced me to Dave – I’d pretty much shot them with Chad prior to that – and then I had to rush next door to the Rainbow Bar and Grill for a quick bite with their Geffen radio promotion’s rep, John Rosenfelder. By this point, I hadn’t eaten all day, and I was starving. I was also a nervous wreck (I’ve struggled with ulcer’s since I was nine!) because if this “quick bite” went too long I could miss shooting the show. I thought about skipping out on dinner, but I didn’t want to offend John, he is a super cool dude – and again, as a starving artist and student, there was no way I could resist free food. So, I get there, order mozzarella sticks and a pizza and watch in horror as people keep saying hello to John. He knew everyone. This was not gonna be a quick bite. Through the window I can see the huge line of kids that has formed at The Roxy next door… and now they’re letting them into the club. The food’s taking forever to come, and I know there’s no way I’ll have time for pizza, but I still have a shot at my mozzarella sticks. Finally, I see the waiter bringing them. Just then this loud, cocky long-haired dude comes over, and just plops down in our booth with us. He’s Kory Clarke, the lead singer of a band called Warrior Soul, that’s supposed to be the next big thing on Geffen Records. He starts shooting his mouth off, can’t shut the guy up. The waiter places my mozzarella sticks on the table and this dude snags them like they’re his. He starts chowing down – double, and even triple dipping into my marinara sauce. All I could do was sit and watch. I felt like one of The Little Rascals staring through a shop window at a cream pie. That did it. I thanked John and rushed back to the Roxy – but by now the club was jam-packed! I tried my best to cram and squeeze through the crowd, but couldn’t move an inch. I end up running into Krist and I tell him that I can’t get a good spot to shoot from. He pulls me backstage, and tells Kurt I might not be able shoot the show – Kurt freaked out. Kurt grabbed me and led me out onto the stage, and asked the kids closest to the stage if I could squeeze in with them so I could take some photos for the band. They smiled, said sure and made room for one more. As soon as the show started, it was mass chaos. It felt like 150 degrees in there and sopping wet, sweaty bodies were flying everywhere. It was incredible! As a fan, I love that kind of energy, but as a photographer, it was a nightmare. I was getting elbowed, kicked, kneed and slammed by flying bodies launching at me from every angle. Amazingly, Kurt not only saw this, but he reached down, grabbed me and helped me swing onto the stage next to him. Parked safely between Kurt and Dave, I was able to get to work. 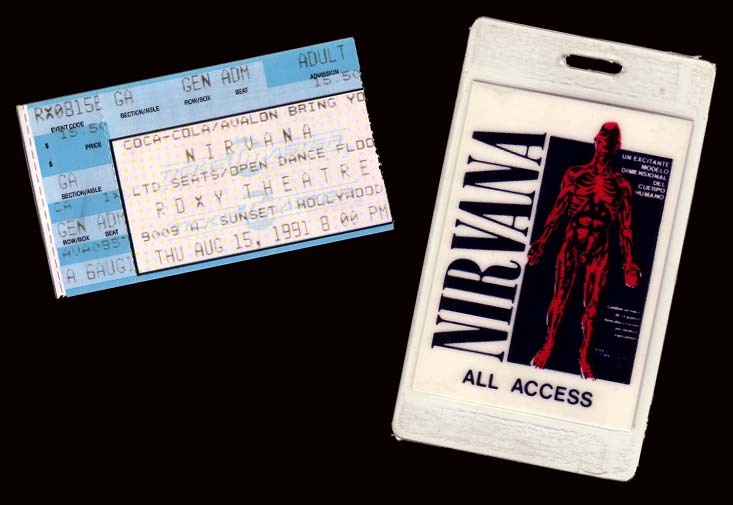 There is no doubt in my mind that this was THE greatest show I have ever been to – no other club show can compare, except maybe the Nirvana show at Raji’s. I really love this photo. 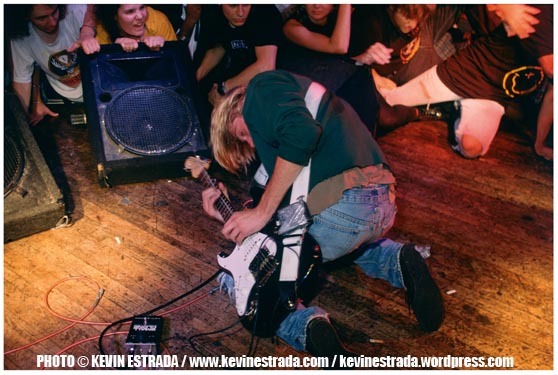 Not only does it show Kurt, on the ground, giving it his all but it shows the crowd exploding right around him. The whole scene was extremely dangerous, but because we were all fans, we looked out for each other and no one got seriously hurt. There was definitely a shared connection that night. And if you ask me, that’s what it’s all about. Photographed on stage with an old Canon F1 camera and a cheap, no name 28-80mm lens. Photographed on Kodak Ektachrome film. This entry was posted on May 16, 2008 at 10:16 am and is filed under music with tags Dave Grohl, Grohl, Kris Novoselic, Krist, Kurt Cobain, Nevermind, nirvana, Roxy, Smells Like Teen Spirit, Teen Spirit. You can follow any responses to this entry through the RSS 2.0 feed. You can leave a response, or trackback from your own site. Its too bad there’s not a bootleg of this floating around, from what I hear its supposed to be one of their best shows ever. Looking at other pictures (via nirvanaguide.com) it looked like one hell of a show.